The 2001 Mars Odyssey mission was designed to orbit Mars to study the planet’s composition, search for water, and measure solar and cosmic radiation. It carries some of the instruments lost on the failed Mars Observer. 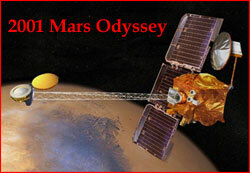 The Mars Odyssey arrived at Mars in October 2001 and achieved a stable mapping orbit in January 2002. Odyssey successfully used an “aerocapture” technique for the first time. The techniques of aerocapturing and aerobraking use the Martian atmosphere to bring a spacecraft from a planetary approach, into an elliptical orbit, then to a final circular orbit over the course of several months. The Mars Odyssey mission carries two primary science instruments, the Thermal Emission Imaging System (THEMIS) which will create a map of the minerals and terrain on Mars, and a Gamma Ray Spectrometer (GRS) will map the global elemental composition and search for water & hydrogen below the surface. The probe also carries a Mars Radiation Environment Experiment provided by NASA’s Johnson Space Center (JSC) which tests the space radiation environment and collects data to assist with the planning of future missions sending Human to Mars. Since completing its primary science mission, Odyssey now acts as a data relay satellite for surface missions, such as the Mars Exploration Rovers.